The E-3A Component is NATO’s only operational unit, making it unique in military history. Its mission is to provide aircraft and trained aircrews to deliver a surveillance and/or control platform whenever directed by the NAEW&C Force Commander. 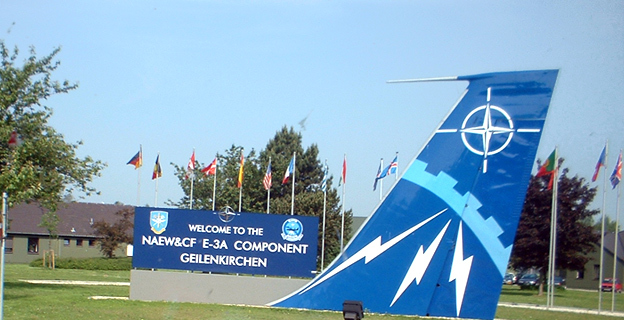 The E-3A Component consists of five main functional entities: the Component Headquarters with normal staff and base support functions, the Operations Wing with three operational E-3A Squadrons, the Logistics Wing, the Training Wing with one Aircrew Training Squadron, and the Information Technology Wing. The position of E-3A Component Commander alternates between Germany and the United States. Each of the Wings is commanded by a Colonel from different NAPMO Nations and the Squadrons are manned by integrated crews comprised of personnel from all participating Nations. The overall Peace Establishment at the Component is approximately 2,500 military and civilian personnel. An additional 450 personnel perform support functions such as base civil engineering, national support units and morale and welfare activities. The Component has also approximately 20 personnel at each of the Forward Operating Bases / Location all provided by the respective host Nations.